When Fuller Center for Housing founder Millard Fuller died in 2009, it was quickly decided that his dream of making sure that everyone had the opportunity to own a simple, decent home should be kept alive. Where better to ensure that dream was kept alive than by going back to the place where Fuller was born and holding a blitz build in Lanett, Ala.? And, so, the annual Millard Fuller Legacy Build was launched. 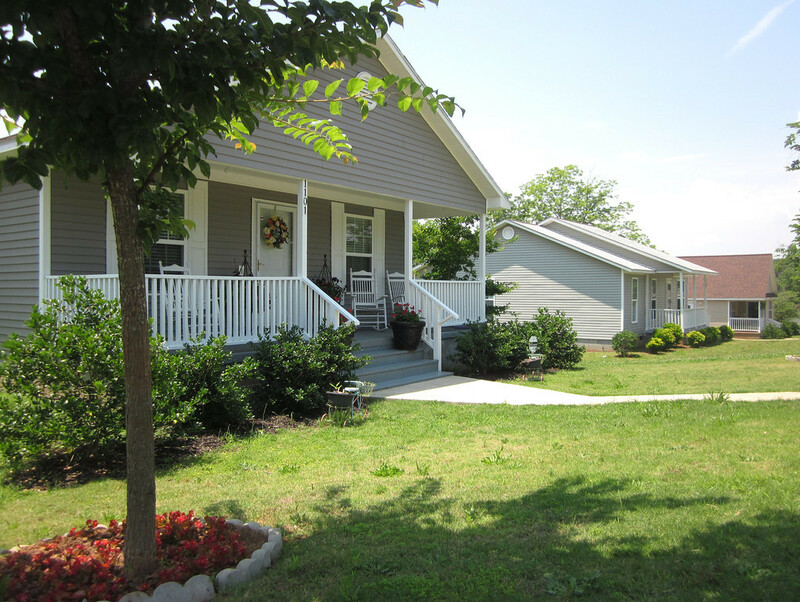 With the construction of six new homes and Greater Blessing repairs made to eight others, the Chattahoochee Fuller Center Project helped launch an annual building blitz that has since transformed communities in Indianapolis in 2010 and Minden, La., in 2011. This year, the Legacy Build will be divided between the Greater Blessing hub of McDonough, Ga., and the new home construction site in the mountain village of La Florida, Peru. Like McDonough and La Florida, Lanett benefited from The Fuller Center’s work well before the Legacy Build began. 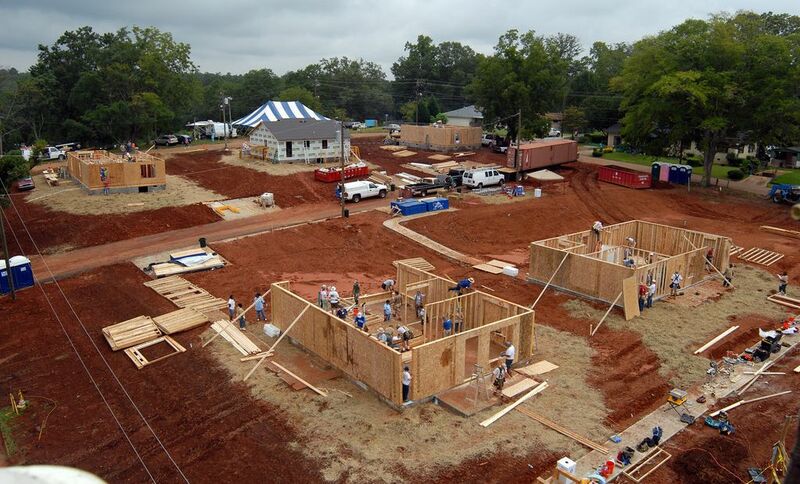 The Chattahoochee Fuller Center Project already had built 17 new homes before the hundreds arrived in late August of 2009 to celebrate the life of Millard Fuller by doing what he loved best — building homes and changing lives. Fuller Center President David Snell said Fuller would have loved the 2009 scene in Lanett but that the Chattahoochee group already had made him proud when they took up “The Theology of the Hammer” in 2007 and came out swinging. With wide support from the community, the Chattahoochee group continues to build upon Fuller’s dream. Next week, they intend to pour concrete slabs for what will become the 28th and 29th new homes built in Lanett and adjacent West Point, Ga. The two homes will be constructed just a couple hundred yards from the site of the first Legacy Build and will add to an already remarkable neighborhood transformation that began five years ago. Chattahoochee gets a tremendous amount of support from its community and has a key partner in InterCall, a communications services company that employs more than 600 people in its West Point call center, which is in the midst of a $30,000 fundraising campaign to sponsor home No. 28. Fundraisers include beauty pageants on June 9 (one for girls during the day and a lighthearted “womanless” pageant in the evening, a golf tournament June 22, a softball tournament in August, a bowling tournament and a motorcycle ride. And every Monday during May and June, employees earn the right to dress casually with a one-dollar donation to the house campaign. Of course, getting the backing of InterCall was a bit of an inside job. The company was launched by ITC Holding Co., whose president at the time was Bill Scott. Scott also was the first president of the Chattahoochee Fuller Center Project. Scott has retired, though Fulghum says he is not one to rest on his laurels. That drive that makes it hard for him to consider a leisurely retirement is the same drive that helped make InterCall the success it is today and helped make the Chattahoochee Fuller Center Project a real difference maker in the community. Snell echoed the sentiment about Scott’s laying the foundation for success. Scott did not pull only his InterCall connections into the mission. He helped get the entire community behind it. And his knack for matching people with situations in which their skills will allow them to flourish is what brought Kim Roberts into Chattahoochee’s fold, adding the gasoline to Scott’s fire. Roberts is a double-amputee who lost parts of both legs at age 4. After 25 years in the business world, she decided to go back to school and train to become a nurse so that she could more directly serve others. While working in a hospital, she developed circulation problems that led to the removal of several more inches from her right leg. Sitting in a wheelchair does not suit her well, so she prayed and asked for the opportunity to walk again and to serve. She got both. And the Chattahoochee Fuller Center Project got way more than a family partnering coordinator. They got someone who helps homeowner partners manage their finances, offers a shoulder to cry on, prays with families and brings them joy. Standing between houses built at the 2009 Legacy Build, she points to No. 19 and sounds like a proud mother as she describes how homeowner Lisa Trammell has become a team leader at the Duracell plant in nearby LaGrange. She then turns to the house she just left, where she had paid another visit to homeowner Mattie Murphy’s crippled daughter, Jennifer, who suffered permanent brain damage from oxygen deprivation during a heart attack years ago. She emotionally recalls when the family moved into their new Fuller Center home and Roberts helped Jennifer take her first shower in years. Her misty eyes then clear and sparkle as she talks about going shopping with the blind homeowner two doors down. “I tell her, ‘You be my legs, and I’ll be your eyes,’” she says with a smile. Roberts says her tireless efforts come from the joy she gets from giving, the true greater blessing, and from the inspiration to serve that she got from Scott. Crosby and Roberts will be among those who converge on McDonough, Ga., for the fourth annual Millard Fuller Legacy Build in September. Though their focus is on improving their own community, they look forward to celebrating the legacy even when they’re not in their own backyard. They would like to see this year’s Legacy Build be a spark for Henry County to build upon in the future and lead to the kind of community involvement they see in the Chattahoochee Valley area. Then again, it could just be something in the water that explains the success in Lanett and West Point, something in that gently flowing muddy Chattahoochee River. That community spirit surrounded Millard Fuller from the day he was born in Lanett (Jan. 3, 1935) and all through his formative years. Roberts never met Fuller, but she feels his presence. So does Fulghum, who got to know him through InterCall and through an even closer connection. Her father and Fuller were cousins who grew up together. Click here to relive the first Millard Fuller Legacy Build in photos. Click here to learn more about this year’s Legacy Build.